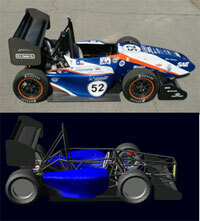 The use of ADAMS in 2010-2011 at the University of Texas at Arlington began with a design project to model the award-winning 2010 FormulaSAE racecar. Combining pre-built templates with customized configurations and settings, the virtual model is able to simulate the real vehicle operating under most race conditions. Maneuvers such as a fishhook, straight-line acceleration and braking, and single lane change were used. There was also experimentation in creating full tracks, and using the SmartDriver built into ADAMS/Car. Such virtual testing will be validated against real-time data when available, and the model altered accordingly. Portions of the car were also tested using the half-car analysis. 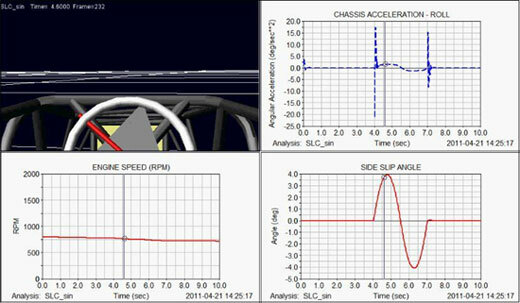 The front suspension kinematic analysis concurred with previous design studies and goals, and was able to go above and beyond to include dynamic elements such as braking and cornering forces. This provides valuable feedback on included part forces, and will become essential to proper design. Figure 1. Top - UTA's award-winning 2010 FormulaSAE racecar. Bottom - ADAMS/Car model of F10. Figure 2. Full-vehicle single lane change maneuver, displaying various model characteristics. The next step has been to develop the HybridSAE model. This is based on the FormulaSAE model, but include applied torques and weights from the new hybrid powertrain. Electric motor property files can be changed to utilize different motors, as well as controlled individually for torque biasing. Ultimately the goal is to co-simulate with MATLAB/Simulink and use the actual code to be ran in the hybrid control computer. This will give huge advantages in being able to develop and debug the controls code before the vehicle even hits the pavement, aiding in concurrent engineering efforts between design departments. Figure 3. 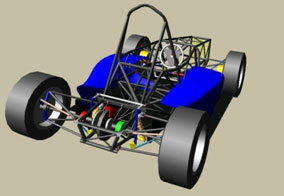 UTA’s 2012 HybridSAE racecar in ADAMS/Car. In the future, having both legacy models ready for modification will be extremely helpful. The majority of this year’s time with ADAMS was purely model development and validation. For both the Formula and Hybrid racecars, dynamic simulation will be a great way to evaluate a design before the construction, and possibly show many flaws before a single part is built. This will greatly increase efficiencies, reduce build time and cost, and be a tremendous asset to our design procedure!